I and my wife Meera became grandparents on June 9, 2006. My son and his wife graduated from a married couple's status to that of parents. 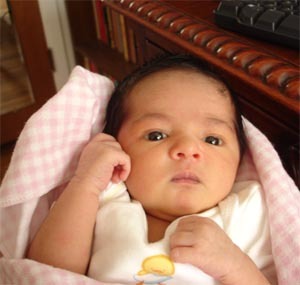 Our first grandchild, a little girl, "Isha" arrived with a promise of fulfillment to all. What does becoming a grandparent mean to me? In one word it means "Blessings". I can relate this to a similar event 27 years ago when my son was born. The same feelings that I had then, came back all over again. I could also sense at Isha's birth that my own expressions of joy and gratitude to God were perhaps similar to those that my father had then. The extension of "Self" via our child and then via the grandchild is just overwhelming. The whole world, nay the entire cosmos, appears to be revolving around this "Self" and working towards its fulfillment. What more can one ask? It's true I am in love again! And with this love is the spontaneity of being able to look life with a new perspective, with innocent eyes and loving pranks. I have already started singing the long forgotten nursery rhymes and lullabies, making monkey faces, jumping around and talking endlessly with my one week old grandchild. Gosh I am amazed at all the energy I seem to get, more so when I hold her in my arms and see her feeling secured, cozy and peaceful. With "Isha" around life itself has become a catalyst and I seem to be "alive and kicking". The bulk of parenting responsibilities and accountability rests with my son and his wife, (May You Nurse Your Own Children) yet as grandparents we can provide expanded support and love and pass on our cultural heritage and the rich family values and traditions. After all family and parenting is synonymous with "Continuity of Life".